The Rycote Windshield Kit 295 is a complete modular microphone windshield system including the Rycote modular suspension mount, windjammer, windshield and necessary extensions. 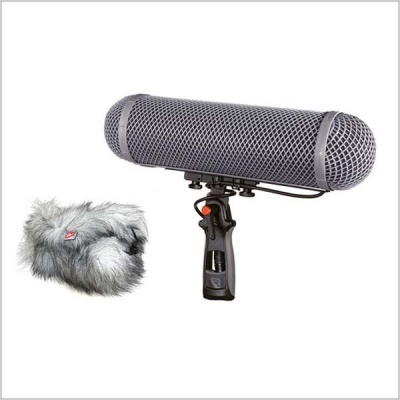 It is suitable for use with the Sennheiser MKH 416, and Rode NTG4 shotgun microphones. The Rycote windshield provides optimum protection against wind and the kit is a useful solution for those who do not already own a suspension mount or windjammer. Each custom configured system will include the correct combination of suspension mounts, windjammer, windshield and extensions (whenever necessary) to accommodate the size requirements for use with your specific microphone. Slightly shorter version of Windshield 4 kit, this system is for use with Sennheiser 416 and the Rode NTG4 and is preferred by some as a historical alternative. A material called Hytrel is used on the end rings and shield. The material aids in creating the "dead" space necessary for quiet operation. Modular locking end rings provide quick and easy replacement of dented ends and modular extensions.